Whether in business or in our personal life, we all know, good communication and listening to others helps build stronger relationships. Downfalls, setbacks and flat-out arguments in all areas of life are usually caused by some level of poor communication. Here’s an obvious example from just the past weekend. On Friday evening one of my buddies sent a group text asking where we - his friends - were at. I replied with the place’s abbreviated name, “We’re at Tav”. This caused him to go across town to Park Tavern instead of the place we were at, Uptown Tavern. Of course he wasn’t happy and said it was my fault. I graciously accepted the blame - end of story. What happened was a pretty common mistake. I left a lot up to interpretation, assuming he would just understand what I was saying. It’s also a mistake that affects many businesses, from assuming customers always remember the day and time of their appointment to thinking customers will always voice their complaints or issues. But this isn’t always the case, schedules get busy and most complaints go unheard or unspoken. Providing the best possible customer experience starts with consistent, clear communication and offering customers the opportunity to voice their feedback. As small businesses grow, gaining more and more customers, they end up feeling the burden of not having the time or manpower to do these two things. But as you’ll see, using HindSite Connect stops the worrying and allows you to focus your time elsewhere - knowing you’re communicating with customers and collecting their feedback with automated emails. HindSite Connect offers two main benefits when it comes to customer service: Eliminating Uncertainties and Collecting Customer Feedback. Essentially Connect is automated emails that integrate customer information living in HindSite’s field service software. These complaints are the result of customers being uncertain because there's a lack of communication. They don’t have the information they need. And this can be solved by automating your email communication to your customer. Communicating clearly and providing customers with much needed information is simple and easy when automated. 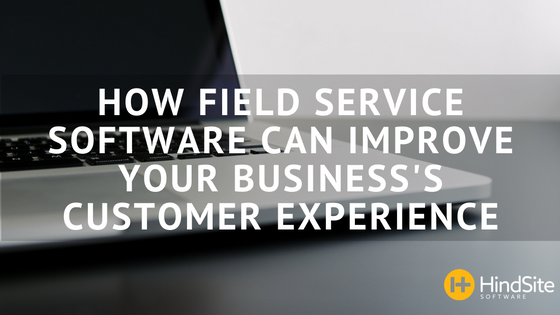 And keeping your field service customers informed is something they will always appreciate. Keep it personal - use variables in your email templates to pull through specific job and customer information like date/time scheduled, their technician and service. You can insert just about any piece of information you collect and store in HindSite, which makes it easy for your business to create personalized customer experiences. As mentioned last week, 96% of dissatisfied customer don’t even bother complaining. Meaning they won’t bring it up on their own so you have to take it upon yourself to collect customer feedback. Once compiled, you’re able to view survey reports where you can easily detect any glaring responses or information. Collecting and analyzing this rare and valuable information, you become aware of (previously unknown) recurring customer issues that you can now make changes to resolve. You can even automate follow-up emails based on positive or negative responses In the end you retain more customers by fixing the leak that caused them to leave your business. With HindSite Connect you have the ability to provide a better customer experience and exceed their expectations through streamlining personalized communication and collecting valuable feedback - saving you time and energy.